In 1982 it was time for a change. 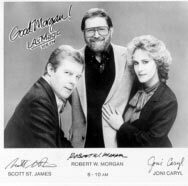 So Robert and his cohort, sportscaster Scott St. James returned to music radio on Emmis Broadcastings MAGIC 106 FM. It was here where he discovered and hired his long-time sidekick Joni Caryl. 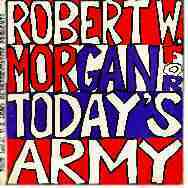 Includes MAGIC 106 composite, Good Morgan Wake-Up Club, Big John's Ugly Sister, Robert Does Military Alphabet, and an interview with Congressman Bob Dornan. Hes been the voice of thousands of radio & TV commercials, movie trailers and documentaries and regularly hosts the KCET-TV Public Television pledge drives. this time to music that was close to Roberts heart. Robert W. and an "After the game chat" with Head Coach Ray Malavasi of the Los Angeles Rams.